Projection TVs are available in two main configurations - front projection and rear projection. 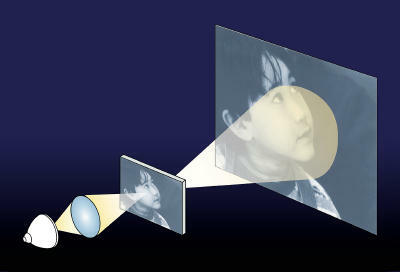 A front-projection system uses a projector and a separate screen, and it projects images onto the front of that screen. This setup looks most like what you'd find in a movie theater - the projection unit is completely separate from the screen. The projector can be placed on a table or mounted to the ceiling. The picture looks best when displayed on a high-quality screen, but a specially painted, flat wall will work as well. Rear-projection systems look more like traditional televisions. They display images on the back of a screen rather than the front, and the projector is completely contained within the television itself. You can also set up a rear-projection system with a projector and a special screen, but the term is most often used to describe self-contained TV sets. Both configurations use tiny devices capable of making very detailed pictures. 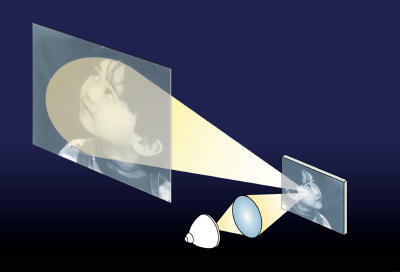 These devices can be reflective, meaning that light picks up the picture by bouncing off the device. Or, they can be transmissive, meaning that light picks up the picture by traveling through the device. Once the light picks up the picture, a lens magnifies the picture and projects it onto the screen. Electrical currents can cause liquid crystals to change their shape. This allows them to act as light valves - different amounts of current allow different amounts of light to pass through the crystal. This lets the LCD device create a greyscale image. To add color, most projectors use a series of mirrors that split the light into red, green and blue beams. Each beam passes through a separate LCD, and a lens collects the three beams and projects the image on the screen. LCDs can also be used to create flat-panel televisions.